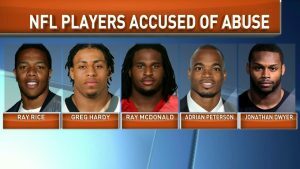 The NFL and Domestic Violence | The Law Offices of Patrick J. McGeehan, PA The problem the NFL does not want to fix. The NFL and domestic violence make strange but understandable bedfellows. I know from my experience as a police officer and an attorney that domestic violence crosses all social and economic boundaries. I have arrested, represented and defended people accused of domestic violence and who were victims of domestic violence. Domestic violence is everywhere throughout our society. Domestic violence affects people in all walks of life. It does not always get reported in the news, but it is there. I have investigated, arrested, and represented people from all walks of life for domestic violence. Domestic violence impacts doctors, lawyers, police officers, teacher, mechanics and everyone else. There is no separation of classes when it comes to domestic violence, it does not matter who you are, or how much or little money you have. The NFL has a severe problem with domestic violence. The NFL can not, or will not, police players and staff. Almost weekly we see news reports of someone in the NFL accused of domestic violence. I get it, football is a violent sport, but there is no reason that violence has to spill over into a person’s personal life at the expense of others. It is not only the NFL, but college football also has its fair share of domestic violence problems. Other sports regardless of the playing level have domestic violence issues, but the NFL has a real problem. Athletes, actors, and celebrities are role models for our children, whether they like it or not. When children see the behavior of role models, they tend to view that behavior as acceptable, good as well as bad behavior. How many times have you caught your son or daughter doing something and the response was “Well _____ does it,” or “______ does it,” or the worst, “Dad does it.” It is only natural. It is all about money with the NFL. The NFL is a business, it makes billions and invests billions in players and staff. The money, and making more of it is the reason for how the NFL deals with domestic violence. When a player is not playing, the player does not make money for the NFL, the team he plays for does not make money, and so on down the line. The player keeps making money of course because it is the written policy of the NFL to suspend a player with pay! The question becomes, where does the NFL draw the line? With the NFL, that line moves somewhat regularly or in some cases, is not present at all. A player who commits domestic violence a second time is subject to banishment from the league. However, that player can petition to re-enter the league after one year. WHAT THE NFL IS DOING IS NOT WORKING, AND IT IS PURPOSELY DESIGNED NOT TO WORK! The NFL needs to appoint someone, outside the league, with real authority, to oversee these domestic violence cases involving players and staff as well as establish a real uniform policy to deal with the problem of domestic violence. Take a look at the NFL’s Personal Conduct Policy; it is a joke.